In this tutorial, You are going to learn about docker. Before you jump into the docker, I want you to know how much time it will take to learn this docker in protractor. For me, it took almost 7 hours to make it work in my laptop, so you can think now how much patience you need to have. I have followed many tutorials, before starting this but somehow things get outdated and will not work, so if this any of the steps in this tutorial is not working keep calm and search in google sometime it may be issue only with protractor so you give a try with selenium. After writing this, i Will start watching "You Were Never Really Here" movie. Docker is nothing but a virtual machine packed in containers, we use the docker to run our protractor Grid. Docker server as a Virtual machine with specific product like Unit with Chrome or firefox. Most of the Companies use the docker to create their own applications just like firefox inside a container. Docker is worth a thing for cross browser testing, instead of paying more money to cloud based companies it is better to use the Docker. I know there is too much of explanations for Docker but this this much is enough for our automation and for all. FYi : I am using Win10 operating system for this tutorial because i have only one laptop, silly. Kitematic provides the UI for the Docker, When you download docker it will be like a cli/cmd terminal, so lets download it. But sometimes this KiteMatic may not work during those time please do use the Docker cli or Command prompt to install things. Similar to this you can download the node images as well. First and for most thing about Docker is, docker is mainly used with Linux, So We have to switch to Windows mode. 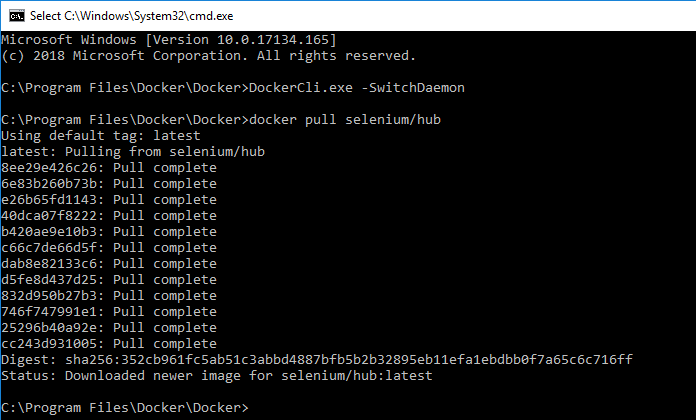 To switch to Windows mode, Navigate to the folder where you have installed your docker using CMD/Terminal, Now if you are able to see the DockerCli file the type the below command in the CMD to switch to windows/or to other operating system. Its not like with one switch you will be able to go windows, it is trial and error switch and try to install, it goes till you are able to install. For installing in Command line we must need to know the command first, and it different from image to image. Yes, you can install the node just like hub but there are two kind of node, which one to chose. You can use the same command to check whether it got installed or not. As I said earlier, you may want to see the execution of the program in the given docker. You cannot view a docker just like that, we have to connect the docker with our system using some tool. I would recommend using the VNC viewer to connect the Docker. VNC viewer helps to connect the Remote machine with Local machine. Now lets come the important part of the tutorial, Let's integrate the protractor scripts with Docker. Be aware that it is a single line change in conf file. Consider below protractor Test file for docker integration, this script will take screenshot of the opened page. Conf file that we use for execution, The only change is SeleniumAddress Parameter in the conf file. SeleniumAddress should be the one That i have highlighted in the Hub in the KiteMatic UI. docker: image operating system "linux" cannot be used on this platform. You will get this error because you might have used some IP for seleniumAddress rather than using the localhost, so seleniumAddress must be localhost then port. Compose is a tool for defining and running multi-container Docker applications. With Compose, you use a YAML file to configure your application’s services. Then, with a single command, you create and start all the services from your configuration. In layman terms, Compose is contains set of commands just like batch file in your windows operating system.